Digital and mobile business models are a tricky beast. Many refer to them and analyze them, but few truly understand them. This is because successful business models in the digital era are markedly different from from the simple, direct, "make and sell" models prevalent (for now) in most consumer industries. This is why some very smart people who have studied and worked with direct business models tend to falter in digital and on mobile. A lack of clarity on asymmetric business model mechanics appears to be the driving force behind the negativity that followed Facebook's IPO in 2012, the recent Google as a conglomerate argument, the current "Peak Google" narrative and many others. Individual arguments don't seem to be enough to sway opinion in these cases, because the claims all stem from the same misunderstanding at the business model level. The only possible way to bridge this gap is to put forth a unified model that explains the mechanics of asymmetric business models, then understand what stage a particular company is in and identify the points at which intuitive analysis might be misleading. The most elegant solution to this conundrum comes from VisionMobile. 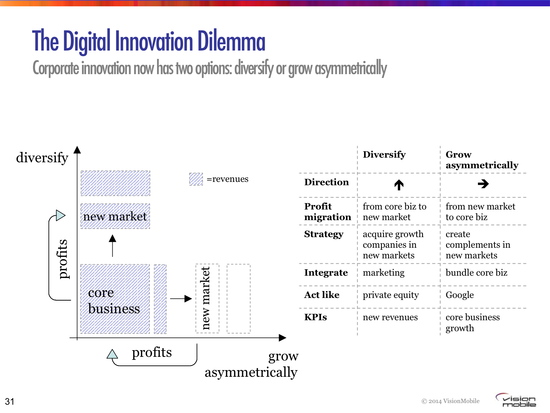 The image at the top of this post, coined "The Digital Innovation Dilemma", shows exactly how asymmetric business models operate and how they differ from traditional business models. In general, it shows that companies have two options to grow -- 1) Diversify, i.e. invest into a new market to generate profits from it, or 2) Grow asymmetrically, i.e. expand into a new market not to generate profit directly, but to make your core business more profitable. This is implemented via a free or cheaply available product that incumbents are unable to compete with. The argument I've heard against these asymmetric business models is that a product with no profit motive gives companies no market signals to improve the product in question. Nothing could be further from the truth. The fact of the matter is that the cheap/free "intermediate" product only exists because it gives the company an asset to grow profits in their core business. The quality of that asset, whether it is data or consumer engagement (usually related) are a direct signal to help improve the product. The easy way to understand this is that companies like Facebook or Google usually have KPIs that are linked to the quality of this intermediate product. This is because key employees know that the profitability of their core business is deeply linked to the KPIs of the intermediate product. Now look at post-IPO Facebook through this lens. In mid-2012, the negativity around Facebook's mobile advertising revenue (core business) was reaching a crescendo as numerous analysts slashed their estimates. This occurred just as Facebook appeared to be "distracted" with pushing app developers to adopt Facebook login (non-revenue generating intermediate product in a new market). This is because investments into a non-profit generating product are seldom viewed with the lens we have used here. App usage data from Facebook logins helped the company create a new ad unit, mobile app install ads, which became the primary driver of the company's mobile advertising revenue (not brand-related ads) and resulted in a shift in the narrative surrounding the company. With the model proposed by VisionMobile, it is easy to see exactly when, why and how analysts make mistakes. Traditional analysts are trained to study financial metrics related to a company's core business. This is so deeply ingrained that they are likely to miss the value of assets being created in an adjacent industry via free or subsidized products, especially when the core business appears to be weakening. What signals did Facebook use to improve Facebook login? Developer adoption and user engagement. Within 6 months of Facebook's IPO, 200,000 apps had already implemented Facebook login. Why? Because mobile developers saw higher engagement and monetization from users that were logged in on Facebook. If consumer engagement was low, it would have slowed developer adoption and reduced Facebook's collection of app usage data, which in turn would have weakened the targeting ability of Facebook's app install ads leading to fewer clicks/conversions and lower revenue. Now take a look at the "Peak Google" argument with the same lens. The narrative appears to be very similar to that surrounding Facebook in 2012 and goes something like this -- Google's mobile search ads (core business) draw lower CPC rates than desktop ads, which has contributed to Google's slowing revenue growth. This is seen as an irreversible trend. Meanwhile, Google is said to be distracted with investments into non-revenue generating or irrelevant initiatives like Google Now, Android, the Internet-of-Things, Nest and self-driving cars. Of course, any potential assets generated through these "intermediate" products are considered to be worthless. Now that I have presented an alternative business model lens, I'll leave further analysis of this narrative as an exercise to readers.